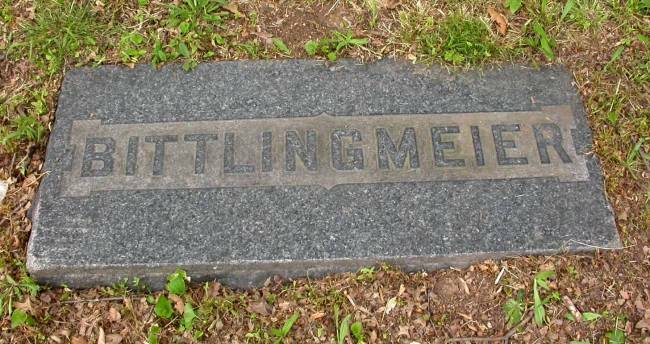 This is the only marker for the graves of Christoph Ludwig Bittlingmeier and his wife Margaretha (Gauss), their sons Louis and William H., and William's wife, Rosalie (Bernes). As of November 2018, thanks to Kathryn and Tom Peters, and Mary Lish, we now know that the plot also contains the grave of daughter Louisa Bittlingmeier Gammel, who was married first to William Schneider (1836-1864), then Jacob Bechtold (1836-1887), and finally to Jacob Grammel (1844-1901). Her marriage to William Schneider lasted just four months when he died in a Civil War battle. Her marriage to Jacob Bechtold produced five children and lasted 22 years until his death in 1887. Her marriage to Jacob Gammel lasted only six months until her death in November of 1890.